Important people get heckled all the time. Our Agents are accustomed to dealing with hecklers. 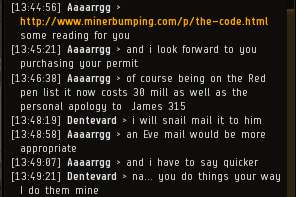 Agent Aaaarrgg was helping some people play EVE correctly when a miner suddenly began disrupting local chat. The villain in question was Dentevard, who'd held a grudge against CODE. ever since he'd been ganked in a fail-fit Covetor months earlier. Dentevard was the CEO of his own mining corporation. Look at that Covetor again, dear reader: This is what he was teaching new players. Dentevard was convinced that Aaaarrgg was some sort of scoundrel--simply because he was affiliated with CODE. and happened to be selling mining permits! Agent Aaaarrgg had a positive, inclusive vision for highsec's future. Dentevard couldn't believe it; he had more of a zero-sum view of things. The Code really is universal in nature. Everyone who plays EVE can benefit from complying with the Code. Dentevard was too suspicious and cynical to accept this truth. 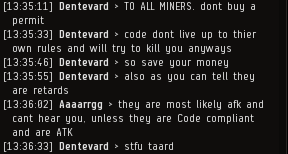 Ever since the New Order first came to highsec, miners have accused us of being bullies. After all this time, they still have failed to produce even a shred of evidence to support their claim. And no, miner, shooting spaceships in a spaceship-shooting game does not constitute bullying. You may as well say that using a mining laser on a piece of rock is bullying. Though he hadn't quit the game yet, Dentevard was obviously unhappy with his EVE experience. One can only imagine the drudgery of mining in highsec month after month, year after year. Aaaarrgg offered him a way out. Dentevard reacted badly to hearing my name. This raised a red flag. The miner grew increasingly upset as Aaaarrgg explained the Code to him. Although the prospect of not being ganked anymore must have appealed to Dentevard, the thought of parting with 10 million isk made him sick to his stomach. The miner's stubbornness proved costly. He now owed Aaaarrgg the sum of 30 million isk. Dentevard had a negative isk/hour ratio for the day. The situation escalated: Dentevard declared himself the leader of a new rebellion against CODE. His attempt to mobilize the local miners failed when he discovered they were AFK. In just a few minutes, Dentevard changed his strategy entirely. He would now become a miner ganker--the most deadly miner ganker in highsec's history. All permit-owning miners would be targeted for destruction. After doing some light research into the mechanics of ganking, Dentevard abandoned his plan to become a ganker. The threat had passed, but those were certainly a tense few minutes. Bitter and dripping with sarcasm, the former rebel leader could do nothing but sulk. 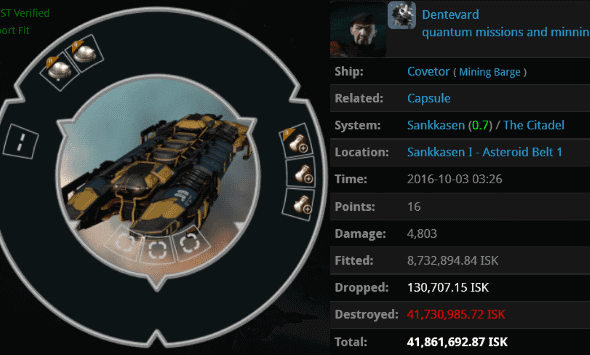 Dentevard had an extra 10 million isk sitting in his wallet, but there was no joy in his heart. Stingy carebears, there's a lesson to be learned here. Phew... That miner really needs to calm down. "Dentevard was too suspicious and cynical to accept this truth." Saviour, if I may, I think you're being too kind. When a miner asks three times what 'everyone' means and still doesn't understand the answer, we've surely slipped from 'suspicious and cynical' to downright thick. I do apologise for my forthrightness, but why do so many of them exhibit signs of such ingrained ignorance? Mining attracts the capsuleers who have failed at everything else they've tried. Guys... CODE is dead. Check this out. Has anyone been able to find any of the anti-ganker corps/alliances on zkill? I checked the top 10 and top 100 but I can't find them. Oh well. 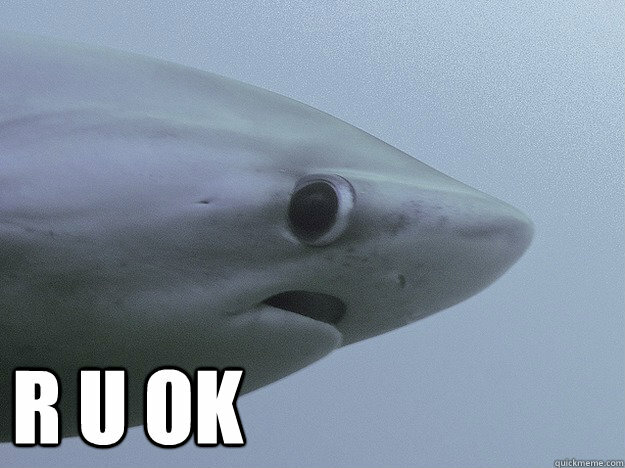 Also... Whatever happened to that scrub alliance who claimed to be kicking Goons out of nullsec. It was something like Mordu's Agfails or Mordumbs Angels or something like that. Anyone remember? They posted on the comments section of our blog a while ago making claims to be kicking Goons out. Oh well, maybe they will try again sometime. Nighttime Video, you seem upset. What's gotten under your (incredibly thin) skin? Come on man. Sharing is caring. Member when Mordus Angles didn't have any sov? "... Dentevard abandoned his plan to become a ganker. The threat had passed, but those were certainly a tense few minutes." Epic fail ganktards. You guys are loosing it! Somehow I got past you in my freighter. LOL!!!! Lol not a single bit of proof. Try harder ag. Hisec Failitia at its best. How have they failed, when you "somehow" getting past them is clearly the most daring thing you've ever done in EVE? They don't even have to lift a finger. You are thinking of them, actively avoiding them, and knowing full-well that anything you do in highsec is "getting away with it" despite them. This is how it should be, you are a criminal who fears the New Order, and has to resort to slinking-by in the shadows under the noses of people far more powerful than yourself. All so you can do the space-equivalent of stealing a loaf of bread from the under King's nose. Antiganking are nothing but spectators in this game. Where is codex bioaids ? કોડ વાહિયાત. બધા કોડ છે તેમના માતાપિતા ભોંયરામાં બંધ આંચકો અને બેઝબોલ બેટ સાથે ગર્દભ માં 8 વર્ષના છોકરાઓ વાહિયાત છે. Kōḍa vāhiyāta. Badhā kōḍa chē tēmanā mātāpitā bhōnyarāmāṁ bandha ān̄cakō anē bējhabōla bēṭa sāthē gardabha māṁ 8 varṣanā chōkarā'ō vāhiyāta chē.